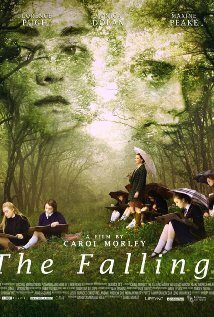 Carol Morley’s The Falling is an intriguing and occasionally mesmerising film, that has somehow managed to stake a claim at the multiplexes, amidst the tub-thumping superhero and action flicks. You’ll have to go back a long way to find something similar; all the way, in fact, to 1975, and Peter Weir’s Picnic At Hanging Rock, with which this film seems to share an affinity for the languorous, sensual qualities of nature. Weir’s story was, of course, based in Australia and this one, somewhere in the UK (it’s never actually specified exactly where) but Morley is fond of counterpointing luscious shots of lakes and woods with the tightly corseted, emotionless wasteland of a girls’ private school. Indeed, the two films have so many scenes in common, I refuse to believe that it’s coincidental. It’s 1969 and the wild and rebellious Abbie (Florence Pugh) is beginning to discover the depths of her own sexuality. Her best friend, Lydia (Maisie Williams) can only watch helplessly as Abbie is inexorably drawn away from her towards Lydia’s brother, Kenneth (Joe Cole). Lydia lives with Kenneth and her tightly buttoned mother, Eileen (Maxine Peake) an agoraphobe who never leaves the house and who seems incapable of portraying any kind of emotion whatsoever. When Abbie finds she is pregnant, it threatens to blow apart the closeted world of the private school she attends and Lydia starts to look for ways to procure an abortion for her friend – but shortly afterwards, Abbie collapses and dies. The resulting shock has a profound effect on her fellow pupils. Lydia begins to experience rapturous fainting spells and as hysteria mounts, more and more more girls (and even one of the female teachers) experience the same phenomenon. In the film’s most powerful scene, pretty much the whole morning assembly succumbs. Is it simply a case of mass hysteria? Or is something deeper and more sinister at work? The film revels in throwing out more questions than it has answers for. Morley’s slow, sensual direction generates an atmosphere of incredible tension and there are occasional uses of subliminal imagery that lend the film an almost hallucinatory quality. As Lydia, Williams delivers an unforgettable performance, while Pugh is so charismatic that her memory haunts the proceedings despite her early exit. Interesting too, to see former Merchant Ivory pin-up Greta Scaachi, taking on the role of the school’s sternest teacher. The Falling is by no means a perfect film, but it’s far more experimental than most movies you’ll see these days and it has an ephemeral quality that will prompt you to talk about it long after the final credits have rolled. Not something you would say about Iron Man or The Avengers.